Bet South Carolina +10.5 over Georgia at 888Sport. Bet Florida –13.5 over Kentucky at 888Sport. Bet Clemson –12 over Texas A&M at 888Sport. Bet Wyoming-Missouri over 53 at 888Sport. Bet Mississippi State –9.5 over Kansas State at 888Sport. It’s Week 2 of the college football season, a time when revelry and high expectations begin to give way to indigestion and stark reality. In the SEC, it also brings something of a lull, with a number of member squads playing either FCS teams or opponents from outside the Power 5. While the opening weekend taught us a few things about Alabama, Auburn and LSU — now where did that come from, Ed Orgeron — the rest of the league remains riddled with unknowns. After gazing into the murk and mulling the options in the betting markets, here are the five best bets for this weekend in the SEC. The Gators didn’t show much in their debut last week under new coach Dan Mullen, easing past outclassed Charleston Southern, and remain the enigma of the SEC East. And yet, when it comes to Florida, one thing is certain — the Gators have a Jedi mind lock over Kentucky, whom they’ve beaten 31 straight times. It’s the fourth-longest winning streak in an uninterrupted series in NCAA history, and some of the beat-downs in the Swamp have been painful to watch. Kentucky last week continued its own tradition, this of sleepwalking past lower-tier opponents, trailing Central Michigan by 10 before rallying to win. The Wildcats looked one-dimensional, with only a meager passing game to complement their base running attack, and head to Gainesville with questions at quarterback. Hardly a formula for bringing such an epic skid to an end. Take Florida –13.5 over Kentucky at 888Sport. The Aggies got the confidence-boosting victory they needed in coach Jimbo Fisher’s debut in College Station, but this weekend represents a serious step up in class for a program whose offensive depth chart isn’t exactly going to intimidate perhaps the best defensive line in the country. Clemson hardly broke a sweat last week in disposing of FCS opponent Furman, but with so many returning players, we know what this team is capable of. The Aggies have a solid running back in Trayveon Williams and some highly capable pieces on defense, but nowhere near the talent level of the team on the opposite sideline. ESPN GameDay will be there, Kyle Field will be in full sway (which it does during the Aggie War Hymn), and Clemson remains likely to once again split time between quarterbacks Kelly Bryant and Trevor Lawrence. But Texas A&M is a year away from making this the kind of game everyone wants it to be. That’s why we’ll bet Clemson –12 over Texas A&M at 888Sport. Missouri was the highest-scoring team in the SEC a year ago, averaging 37.5 points per game, and the Tigers hung 51 on poor FCS opponent Tennessee-Martin in their opener. Wyoming gave up 41 last weekend to Washington State, which runs an up-tempo attack somewhat similar to the one the Cowboys face this week. While Missouri’s high-flying offense is often brought back down to earth by higher-caliber opponents, Wyoming doesn’t exactly fit that description. Quarterback Drew Lock and the Tigers typically pour it on against opponents outside the Power 5 — they scored 68 on Idaho, 52 on Connecticut and 72 on Missouri State last season — and this weekend should be no exception. With an NFL-bound quarterback in Lock and a top-flight receiver in Emanuel Hall, Missouri might exceed 53 points on its own. Take over 53 at 888Sport. Kansas State needed a touchdown with 7:21 remaining last weekend to rally from 12 points down in the fourth quarter and avoid an ignominious home loss to an FCS foe. This from the same Wildcats program that revamped its coaching staff after last season and saw Bill Snyder replace both his coordinators for the first time in 20 years. Meanwhile, Mississippi State under new coach Joe Moorhead has the pieces to continue its breakthrough from last season, with a standout dual-threat quarterback in Nick Fitzgerald and a solid defense led by ends Jeffery Simmons and Montez Sweat. Mississippi State is far more explosive offensively than Kansas State, which passed for just 152 yards in the opener, doing most of its work on the ground. That strategy should play right into the hands of a stout Bulldogs defensive front. Bet Mississippi State giving 9.5 at 888Sport. This number starter high and just kept on climbing, with Georgia favored by 10.5 on the eve of the weekend. That seems like a lot — especially when you consider a South Carolina team missing wide receiver Deebo Samuel lost by 14 last year between the hedges, and the Gamecocks have much of the same cast returning for this game in Columbia, where they’ve won three of the last four in the series. Even against an outmanned opponent and with a new play-caller, last week brought none of the fits and starts we’ve typically seen from a South Carolina offense. Perhaps that means defensive-minded coach Will Muschamp is finally getting out of his own way. 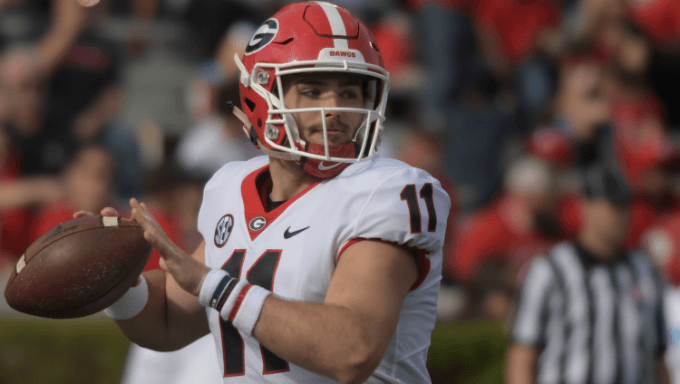 The Gamecocks may struggle with a veteran Georgia offensive line protecting savvy Bulldogs quarterback Jake Fromm, but still have enough weapons to at least keep this in single digits. Take South Carolina giving 10.5 at 888Sport.